Fragtastic Reef sells Protein Skimmers, Reactors, Fish Food, Aquarium Lighting, and everything you need for your saltwater and reef aquarium right at FragtasticReef.com or our retail store. With over 16 years experience we specialize in aquarium supplies and everything related to the saltwater aquarium hobby. Fragtastic Reef is a Ma & Pa Full Retail & Local Fish Store located in Mankato, MN. We specialize in saltwater aquarium supplies, fish, and corals. Since having a Full Retail Store allows us to provide customer service 7 days a week. our customer service is the best and unmatched by anyone! 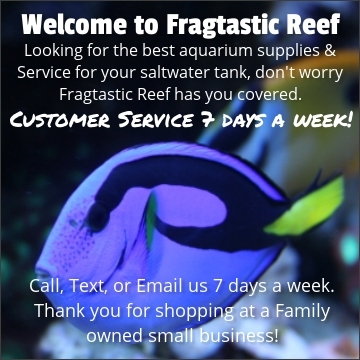 Fragtastic Reef is not just an online aquarium supply store, we actually have a storefront! We do live corals, live fish, equipment, and everything you would need for your aquarium 7 days a week. If you have questions on any supplies or livestock we can most likely help you, for virtually any saltwater aquarium questions! Want to save money and get discounts on every order you place at Fragtastic Reef? Sign up for a Membership Today and start saving, plus exclusive deals! Best customer serivce I have ever had when picking out the protein skimmer that was right for me! Thank you again Fragtastic for helping me get the skimmer, lighting, pumps, and everything I needed for my aquarium.